A Shropshire author, who has penned a new children’s book about a parrot, has met with the world’s longest surviving green-winged macaw. But at the grand age of 92, Poncho, a Hollywood star in her own right, took the visit all in her stride. 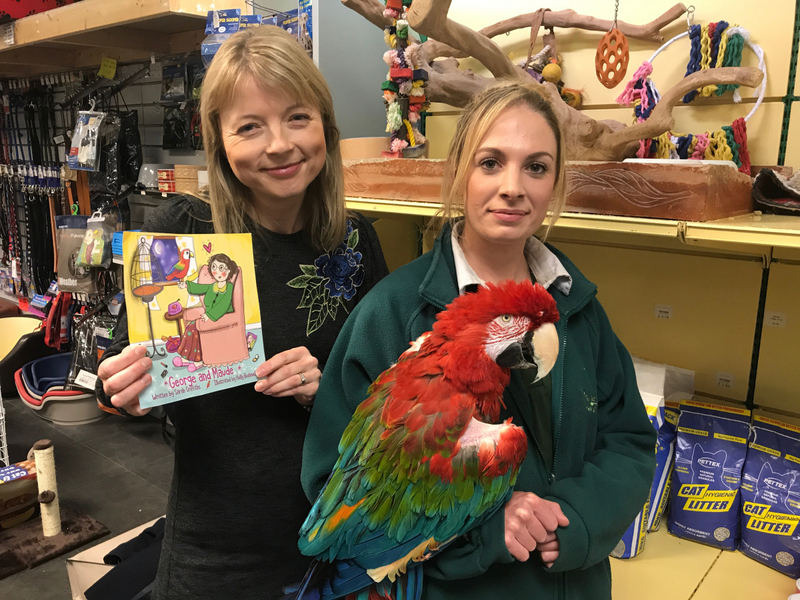 Sarah Griffiths, the author of ‘Douglas’s Trousers’ and new book ‘George and Maude’ met Poncho at Beck’s Pets and Exotics in Shrewsbury, on Friday afternoon. For Sarah, who lives in Leegomery, the encounter with the Hollywood star was considered rather special. She said: “My new book which will be released on Amazon later this month is all about a nosy old lady called Maude and her clever parrot George, who loves to imitate people. “However, when I first spoke to pet shop owner Sophie, about me coming along, I had no idea Poncho was so famous so it makes meeting her all the more special. I’ve always had a love of birds but in particular parrots. “When I was younger my aunt and uncle had a green-wing macaw parrot and I always used to love visiting it and that’s where the idea for my latest book originated from. Poncho retired to Shropshire several years ago following a career starring alongside A-list celebrities including Jim Carrey, Eddie Murphy and Glenn Close in hit movies such as 102 Dalmations, Ace Ventura- Pet Detective, Doctor Dolittle. Emma Small, who works at the shop and has known Poncho for eight years, said the parrott first came to the UK in 2000 to appear in the film 102 Dalmations but was too frail to return home so retired in Shropshire and was taken in by Sophie and her mum Rebecca. Those interested in taking part are asked by Sarah to write and illustrate a short story based on their favourite exoctic pet. Entries should be no more than 250 words and the winning entry in each age category, 3-4 years, 5-6 years, 7-8 years and 8-9 years will be displayed in the pet shop for everyone to read. Winners will also receive a signed copy of Sarah’s new book ‘George and Maude’.